No matter what age you are, it’s important to ensure you get good nutrition in your diet. This is especially crucial for older adults, as a balanced diet has been shown to be effective in helping improve health issues like kidney disease or high blood pressure. Good nutrition is also useful for preventing potential future issues like diabetes, heart disease, obesity, and strokes, among others. Older adults should aim to consume a diet that contains all of the vitamins and minerals needed by the body, as well as a healthy amount of protein, fat, carbohydrates, fibre, and fluids. Maintaining a balanced diet is an essential part of staying in good health in later years. Vitamins are one of the most essential aspects of good nutrition. There are 13 vitamins in total; 4 are fat-soluble and 9 are water-soluble. The fat-soluble vitamins include A, D, E, and K. The water-soluble vitamins are vitamin C and the 8 B vitamins, which are thiamin, riboflavin, niacin, pantothenic acid, biotin, B6, B12, and folate. Vitamins are used by the body to do hundreds of things, such as maintaining the immune system, healing injuries, and regulating metabolism. 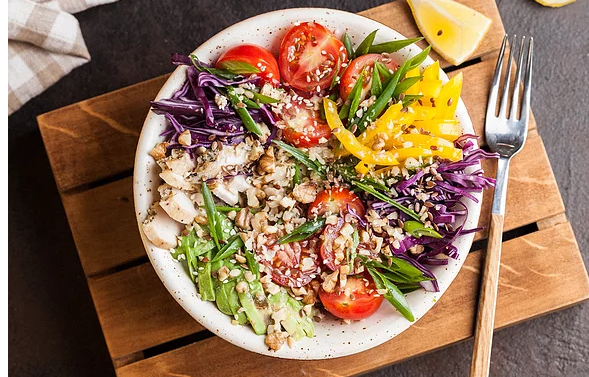 The best way to get all the necessary vitamins and minerals is to eat a balanced diet of fruits, vegetables, whole grains, dairy, meat, and legumes. Eat Right Ontario recommends that older adults get at least 7 servings of fruits and vegetables per day, as they’re great sources of vitamins A, C, E, and K. For B vitamins, meat and legumes are great sources, whereas milk and other dairy products are full of Vitamin D. It’s also recommended that all older adults take a vitamin D supplement of 400 IU every day. Minerals are also an important part of proper nutrition, with the major ones being calcium, sodium, potassium, magnesium, and phosphorus. Most minerals needed for proper nutrition can be found in vegetables, meat, or legumes, so getting enough of each group is vital. Calcium is important for strong bones and can be found in milk, cheese, yogurt, and other alternatives. The recommended amount of calcium for older adults is around 1200mg per day. Salt is another important part of the human diet, as it contains sodium. Salt can be found in foods like meat, dairy, eggs, and some vegetables like celery. Salt is also used as a flavouring in many processed foods, but these should be eaten in moderation. While salt is needed by the body, too much salt can lead to health complications like high blood pressure. Older adults should aim for a recommended daily salt intake of 1200-1300mg, and try not to exceed 2300mg. Protein is used as energy by the body for growth and maintenance. It’s important for building muscle, so protein is especially important for older adults. As humans age, we lose muscle – the medical term for this is sarcopenia. Some people can lose as much as 3% to 5% of their muscle mass per decade after age 30. As muscle mass decreases, the muscles get weaker. This can lead to difficulty for older adults when performing daily tasks like bending over or going up stairs. Protein is important for building muscle mass and maintaining strength at older ages. Some great sources of protein are meat, eggs, fish, and legumes like nuts and beans. Most adults should aim to get 0.8 grams of protein per kilogram of body weight per day. For a 150-pound person, this would result in 54g of protein per day. For adults over 70, some specialists suggest this ratio be increased to 1 gram per kg per day. This would set the recommended intake for a 150-pound person at 68g per day. Fats are an essential part of a balanced diet, as they are used as energy by the body to insulate it and keep it warm. Fats are also necessary to help the body absorb fat-soluble vitamins. There are several types of fats which are found in food, with the four main groups being monounsaturated fats, polyunsaturated fats, trans fats, and saturated fats. The first two, the unsaturated fats, are healthy and good for the body. Saturated fats and trans fats are generally unhealthy and can cause health risks. Many unsaturated fats are found in nuts, oils, and fish. Monounsaturated fats can be found in almonds, avocados, and olive oil. Polyunsaturated fats can be found in walnuts, soybean oil, and fish like tuna and salmon. Saturated fats are found in meat products like beef or bacon, as well as in dairy products and butter. Trans fats are mostly found in processed foods like fried foods and baked goods. It’s recommended that adults get between 20-35% of calories from fat. It’s a good idea for older adults to include unsaturated fats in their diets, but to limit consumption of saturated fats and avoid trans fats when possible. Carbohydrates are another source of energy for the body, similar to fats and proteins. Simple carbohydrates are sugars like glucose and sucrose, while complex carbohydrates are starches. Sugars are commonly found in fruits and vegetables as glucose and fructose, or in processed sugar as sucrose. Starch is found in foods made with wheat, such as bread or pasta, and in other crops such as rice and potatoes. It’s recommended that older adults get at least 130 grams of carbohydrates per day. Fibre is a form of non-digestible carbohydrate, with the two types being soluble and insoluble. Soluble fibre helps lower cholesterol and regulate blood sugar, and insoluble fibre moves food through the intestines and prevents constipation. Foods that contain soluble fibre include nuts, dried beans, and oats, while foods like whole-wheat products, green leafy vegetables, and fruit skins contain insoluble fibre. For adults over 50, the recommended daily amount of fibre is 30 grams for men and 21 grams for women. Many people only get half the amount of fibre they need, so it’s important to get enough. Older adults should make certain that they’re consuming an adequate amount of fluids, as this can sometimes be difficult to detect. As people age, their thirst receptors change. Not only do the thirst signals get weaker, they require consumption of less fluid to feel satisfied. Older people feel thirst less strongly, and when they do feel thirsty it only takes a little bit of fluid to feel satiated even though the body may still crave more. This can lead to dehydration and even death in severe circumstances. The recommended daily fluid intake for older adults is 3.7L for men and 2.5L for women. One study showed that less than half of Americans over the age of 65 meet these recommended guidelines, so it’s important that older adults drink more fluids, even if they don’t necessarily feel thirsty. This total recommended intake can come from both beverages and food. Water and other beverages should be consumed regularly throughout the day to ensure proper hydration. If more fluid is needed, foods that contain water can be eaten, like fruits and vegetables. There may be times when it can be difficult to feel motivated to eat healthy. Having people to cook and eat with is one way to stay on track. It’s also important to pick out recipes which are delicious, healthy, and not too difficult to make – having these can make it much easier to stay motivated. Keeping a balanced diet that meets all the recommended nutritional criteria may sound daunting at first, but it’s a lot easier than it sounds. Plus, it’s worth it. Over the course of a day, there are plenty of chances to ensure all nutritional needs are met with various snacks and meals. Old age doesn’t have to be a time when people become sick, frail, and weak. A balanced diet and proper nutrition can do wonders to keep older adults healthier longer.